Eleven deacons were on August 9, 2014 ordained priests at Maria Assumpta Cathedral Owerri by His Grace Most Rev. Anthony J.V. Obinna, Catholic Archbishop of Owerri. 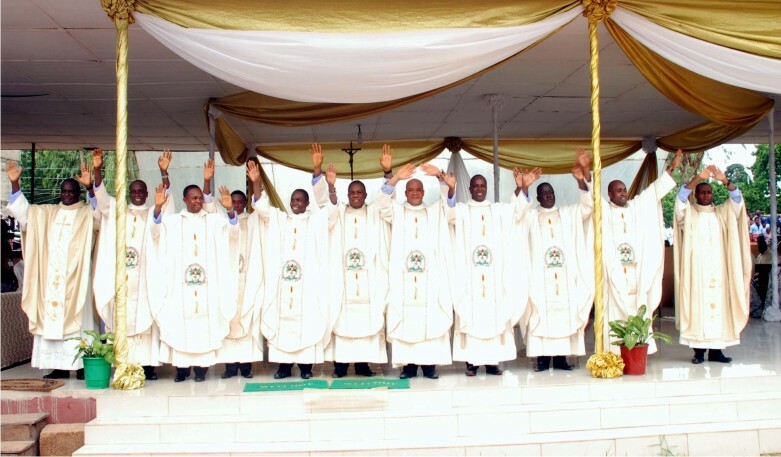 Nine of the deacons were ordained for Owerri Archdiocese while two belong to the Ordo Matris Dei (Order of Mother of God) Congregation, whose Rector-General, Very Rev. Fr. Francisco Petrillo OMD, assisted the Archbishop at the ordination ceremony. The new priests are: Rev. Frs. Bartholomew Sunny Uchegbu (Izombe), Valentine C. Chukwu (Ogbor-Ugiri), John Paul Igbokwe (Nnebukwu Oguta) and Remigius O. Ebiziem (Ndegwu-Umunwoha). Others are Rev. Frs. Malachacy Ukaonu (Ikembara-Ikeduru), Prosper Chisom Maduike (Umuekwune Ngor-Okpala), Boniface Iwu (Azaraegbelu-Emekuku), Michael Duru (Amaulu-Mbieri) and Paul Nwachukwu (Umuofor Amaimo). Ordained for Ordo Matris Dei (OMD) are: Rev. Frs. Augustine Agowuike (Umuokeh-Obowo) and Francis Enyi (Ogor-Affa, Udi L.G.A., Enugu State). In his sermon at the ordination, the Most Rev. Obinna harped on the importance of obedience in the lives of priests in particular and Christians in general. He noted that disobedience is a serious problem among priests despite the fact that they took the vow of obedience to their Bishops and Superiors. “Our problem is obedience. It is the most difficult vow for priests and religious”, the Archbishop said, adding that once there is obedience other vows like poverty, chastity and celibacy will follow. The prelate observed that though disobedience exists even in families and various organizations because it is difficult to bend an adult, but such disobedience by priests and religious is very dangerous. He noted that he too is a servant and subject to authority and therefore is bound to be obedient. The ordaining prelate noted that sometimes people, including priests decide to be disobedient because of their academic intelligence. “But for me, I have to be foolish and stupid for the sake of Good News, afterall the foolishness of God is wiser than the intelligence of man”. He reminded the new priests that “for you to be successful priests, you must accept to be foolish. He therefore advised them to be disciplined and obedient, adding that without obedience, conforming to the will of God will be difficult but with obedience and discipline you’ll no longer be bothered with materialism or things of the flesh. He used the opportunity to advise older priests to reflect on their lives, whether they are living lives of holiness, obedience, chastity and poverty; whether they are leading the flock to Christ or Satan. Turning to the congregation, Archbishop Obinna also reminded them that they too are called to live holy life, life of righteousness that will please God as nobody has license to sin. Our reporter said the Owerri Archdiocesan Choir led by Dr. Louis Ekezie of the Department of Music, Alvan Ikoku Federal College of Education Owerri, sang at the Mass attended by hundreds of priests from various parishes/dioceses including thousands of jubilant relations and well-wishers of the new priests.